If you are an RV traveler going anywhere in Mexico, you need this book. There is nothing else like it out there. Without it, you won’t have a clue where you can find campgrounds with such niceties as water, sewer, and electricity. Strong words, but we have used the Traveler’s Guide to Mexican Camping: Explore Mexico and Belize with RV or Tent constantly on two long trips to Mexico, and it is incredibly useful. 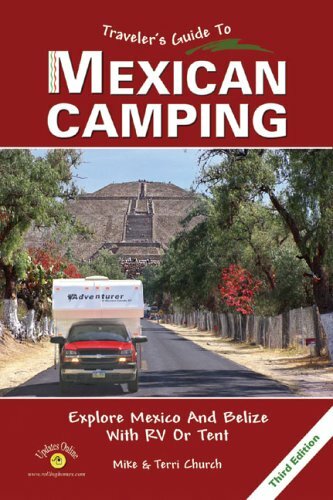 Authors Mike and Terri Church go all over Mexico, GPS unit and sharp eyes at the ready, and they write detailed descriptions of campgrounds that are right in the mainstream and of ones that nobody might ever find otherwise. Their directions on how to get to these places, and what size rigs can go there, are superb. There is also a version for Baja alone. Of course, no guidebook is perfect. 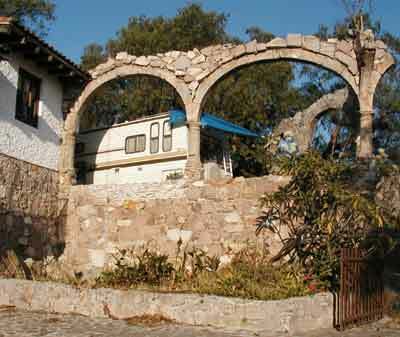 We have found a few other Mexican campgrounds just by driving around, or on the internet, or occasionally mentioned in general guidebooks. Some of the places listed here have since closed. 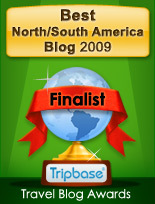 I wrote this review while my husband and I were spending a month at the Morrill trailer park in Guanajuato. The photo shows our sweet little spot, complete with our own patio and full hookups. We found out about this place through the Traveler’s Guide to Mexican Camping. Recently a German couple arrived at this campground because some other Germans had told them about it. They were just beginning their trip through Mexico, and didn’t know about “the Churches’ book,” as travelers often call it. They borrowed our copy — we were already very good friends by then, or I would never have let it out of my motorhome. They were just going to phone their daughter in San Francisco and have her get it and mail it to them when some Canadians pulled in. They had just been in San Miguel de Allende, a town with many English-language resources. They were quite sure our German friends could get a copy of Traveler’s Guide to Mexican Camping there. RV travel in Mexico has been revolutionized by this book! It depends on where you are, Serge! In the US, you can buy it at Amazon.com or any local bookstore should be able to special order it for you. In Mexico, it *might* be available at one of the few bookstores that carry English language books.